January 20: The Air Force was invited to join Project Orbiter and to supply help including tracking. January 22: The Department of Defense announced that work was underway on an ICBM with a range of 5,000 miles and an accuracy of 10 miles C.E.P. February 12: Soviet government approved the development of Baikonur. February 14: The Killian Committee recommended the concurrent development of an IRBM of 1,500 miles range, to match the ICBM effort. March 21: Eighty-eight members attended the annual Space Medicine Branch meeting in Washington DC. (more than double from 1954). Capt. Ashton Graybiel was elected President. Forty-six new members were elected and the total membership was now 131. There was still a large controversy concerning the name of the organization, its relationship to the parent organization, conflict in membership requirements, and conflict in having meetings parallel to the general meetings. 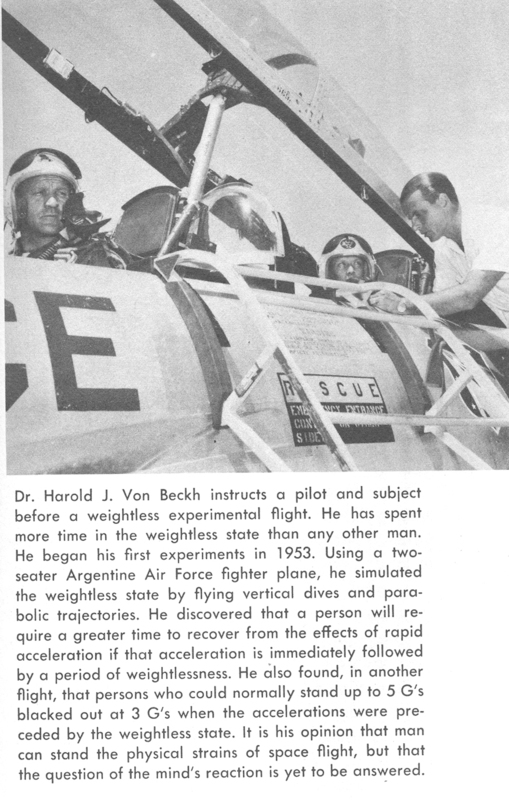 The organization had already taken in a number of members who were not physicians, who could not qualify for membership in the Aero Medical Association, but who were already prominent in the space effort in one way or another. There was also a hesitancy on the part of a number of the members of the Aero Medical Association who did not believe anything much would come of the embryonic effort. Space Medicine Panel: On The Threshhold of Space (see link below). March: Rocketdyne established the feasibility of a rocket engine with over one million-pound thrust. They also began developing the E-1 rocket engine as a backup for the Titan I. Both were Air Force projects that were later dropped. March 11: Korolev approves of the final design of the Soviet R-7 ICBM. March 16: U.S Air Force proposes the strategic satellite reconnaissance system (WS 117 L). It will eventually become Corona/Discoverer (satellite imagery with film recovery), Samos (satellite imagery with image transmission), and MIDAS (Missile detection and alarm system). Both the CIA and ARPA would become involved. 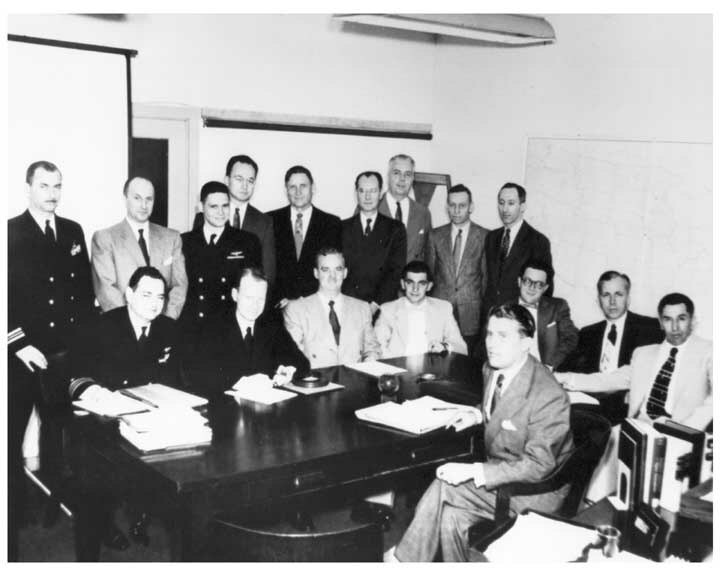 March 17: The Orbiter Committee meets in Washington DC to finalize plans for placing a satellite into orbit within the year. 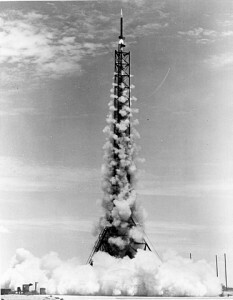 April 21: The first Aerobee-Hi was launched, reaching 113 miles a1titude. Aerobee-Hi nominally had 4000 pound thrust, 150 pound payload, 150 mile altitude. April: The NII-4, directed by Korolev, issued a report advocating “the creation of an artificial Earth satellite”. May 23: The Project Orbiter team gathered at Cape Canaveral to see a Redstone firing and to establish the timetable that would lead to a launching in late 1957. June 1: Project NERVA (nuclear rocket engine) is initiated. July 29: The National Academy of Sciences and the National Science Foundation announced that the United States was planning to construct an Earth satellite which would be launched during the International Geophysical Year. The satellite was to be patterned after Professor Fred Singers MO– USE concept. July 30: The Soviet Union revealed that it planned to launch an Earth satellite like that of the United States. August: National Geographic published the article “Aviation Medicine on the Threshold of Space”. September 9: The Stewart Committee reviewed the alternatives of waiting for an Air Force Atlas launcher for the first satellite, using a modified Army Redstone, or developing a new Navy rocket derived from the Viking. The committee voted 7-2 in favor of abandoning Orbiter and developing Vanguard. October 7: The Martin Company was awarded the prime contract to build the Vanguard satellite launching vehicle, and General Electric received the contract for the first stage rocket engine. October: Martin Company was selected to build the Titan I launch vehicle. November 8: The Department of Defense approved the assignment of an intermediate range ballistic missile project to the Air Force. The assignment of this 1,000-mile range missile was not to limit the Army in pursuing the development of Redstone, which had a range of about 200 miles, but also had a further growth potential. 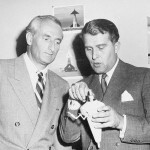 This decision led later to development of the Air Force Thor and the Army Jupiter. In 1955: Dr. H. Tsien, an MIT-trained rocket scientist at the California Institute of Tecchnology, returns to his native China, after accusations of spying in the US. Thomas, H P, Edelberg, R, Henry, J P, Miller, J, Salzman, E W, Zuidema, G. D. Human tolerance to multistage rocket acceleration curves.